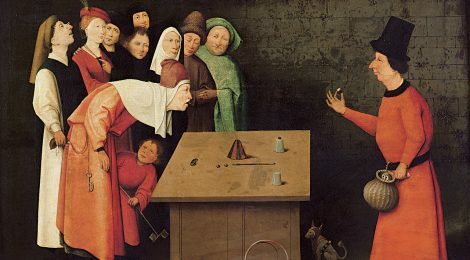 Hieronymus Bosch (c. 1450-1516) was an influential Dutch painter, known for his illustrations of religious tales and ideas. Through his artworks, we can see how mental illnesses were perceived in the Netherlands during the 15-16th centuries. The oil painting below is entitled: “Cutting the Stone” (also known as “The Extraction of the Stone of Madness” and “The Cure of Folly”). It depicts a surgeon removing a rock from the patient’s cranium which was believed to be the source of mental illnesses. The inscription reads in English: “Master, quickly cut away the stone. My name is Lubbert Das” [Lubbert Das is a typical foolish character in Dutch literature], implying that the patient is perhaps even more foolish than his foolish surgeon. 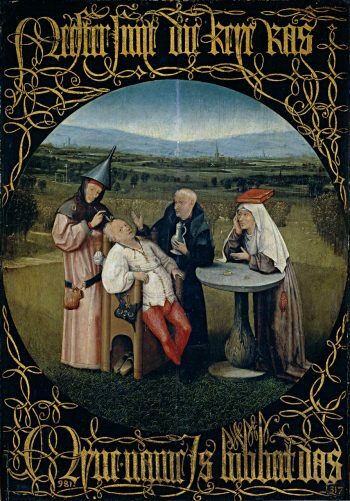 Bosch’s paintings suggest that medieval mental health treatments were a target of lampoons even during his times.